Swimming in New York is a fun activity if you want to escape the heat in summer. During the summer period Manhattan can get very hot, so be prepared if you’re planning on booking a trip in July or August. New York is a crowded city full of buildings and traffic and air-conditioning seems to be the only way to keep cool. Manhattan doesn’t offer a lot a places to swim, but there are several outdoor swimming options in other parts of the city. There are also lots of other activities and places to go to in order to beat the heat: New York has several nice beaches! If you love going to the beach, New York has a few good options. You can for instance spend a day at the Hamptons and mingle with the rich and famous. The Hamptons are quite far from Manhattan and it will take you a while to get there using public transportation. If you want to visit this place, it’s best to book your New York to The Hamptons day trip in advance. In Brooklyn you’ll find Coney Island: a nice place known for its large beach and amusement park. This beach isn’t very close to Manhattan either, so the best option to get there is by bus! Why not take the Pizza Tour to Brooklyn and Coney Island? During this tour you’ll discover Brooklyn, taste pizza and visit Coney Island. You can stay at Coney Island for as long as you like to enjoy the sun. Another New York beach is Rockaway Beach on the south side of Queens. The easiest way to get here is by taking the Rockaway route of NYC Ferry, offering you a nice boat ride at the same time. You can enjoy the beach and the Atlantic Ocean without any hassle if you choose to rent your beach chair, beach umbrella and beach towel! Do you prefer going to an actual outdoor swimming pool? Then head to one of the pools in New York. There’s a swimming pool in Brooklyn Bridge Park: the Pop Up Pool. This freely accessible swimming pool has a limited maximum capacity. There is a swimming schedule to make sure everyone can enjoy a dip. Soon, the revolutionary +POOL in the East River will open. This floating pool is shaped like a giant + and filters the river water, enabling people to swim in it. 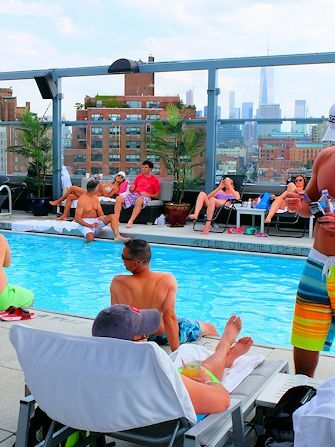 Eric’s Tip: The Royalton Hotel in New York (formerly known as the Gansevoort Hotel) has a pool and rooftop bar. If you want to enjoy a rooftop dip every day, you can book a room at this hotel on Park Avenue. There are lots of other summer activities that you can do in New York in order to escape the heat. Please note that all the listed activities are seasonal. So don’t miss out if you’re planning on going to the Big Apple during the summer holidays! 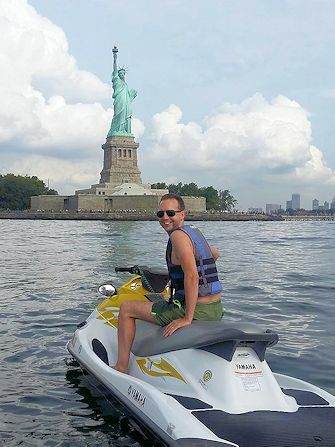 Did you know that you can go jet skiing in New York? While cruising the waters, you’ll be able to admire all major highlights of the city. You’ll pass by the Statue of Liberty at 88 kilometres per hour! This activity starts and ends at Rockaway Beach. After your jet ski experience, you can enjoy the beautiful weather on the beach. Eric’s Tip: Yes I did it and yes it’s worth it. And yes you really go that fast! And I wouldn’t hesitate for a second to do it again. If you love water sports, but don’t like speeding, kayaking on the Hudson is a good option. You can even go on a tour if you’ve never kayaked before. With a tour you combine sightseeing and sports. You’ll be able to practise for a while around the dock before following the guide towards the Hudson. You can also go paddle boarding in New York. This water sport, also known as stand-up paddle boarding or supping, is a fun activity on a hot summer day. You’ll first get instructions on land, before heading out to the water with your guide. Beginners get basic instructions whereas more experienced boarders will focus on their techniques. Eric’s Tip: Are you travelling with kids and looking for a cooling activity? Many playgrounds in New York offer different water elements where kids can splash around. Head to the Heckscher Playground in Central Park for instance, just make sure kids have waterproof shoes on!